A right para sellar and a left supra sellar ovoid well circumscribed lesions with T2 flow voids in relation of ICAs, show flow related signals on 3 D TOF Non contrast MR Angiography suggestive of a right ICA cavernous portion and a left ICA supra clinoid portion aneurysm. 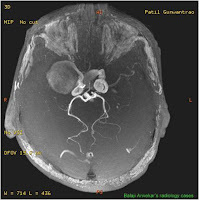 When unilateral ICA aneurysm seen equally distributed on either side. 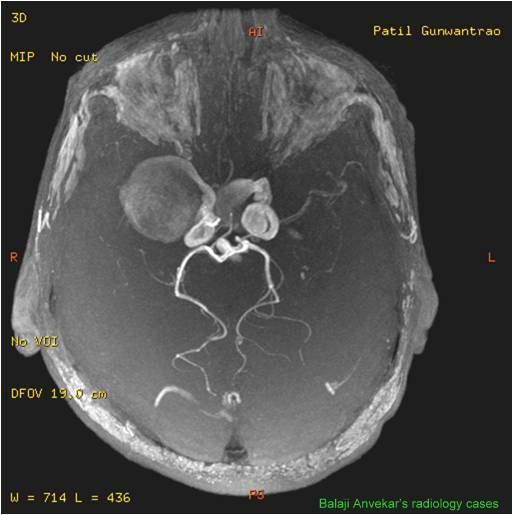 When involve bilateral ICA called mirror aneurysms.